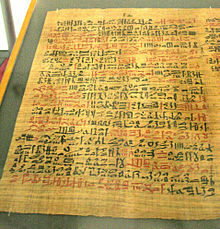 The Ebers Papyrus (c. 1550 BC) is an ancient Egyptian medical treatise. It covers both practical and magical advice. There are over 700 different drugs described in the papyrus. Some are useful such as opium for pain. Other things in the papyrus can seem ridiculous. An example of that is tapping a person on the head with a fish if they have a migraine. Aside from covering a large number of treatments, the papyrus also has information on a broad range of ailments from intestinal complaints and eye problems to depression or other mental disorders. This page was last changed on 18 July 2013, at 09:19.